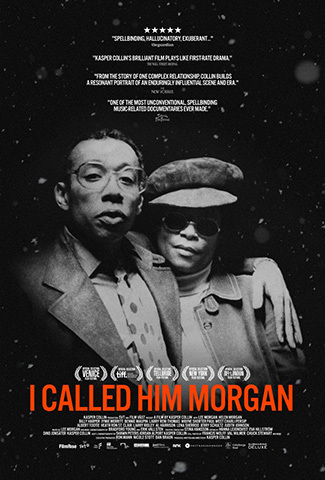 There has not been a penetrating and provocative documentary in my recent memory that chronicles with such curiosity, the insight and intimacy into the musical process and romantic partnership disillusionment than Swedish director-writer-producer Kasper Collin’s compelling and resonating true crime documentary, I Called Him Morgan. Collin (“My Name Is Albert Ayler”) provides a winning, yet disturbing, account of the moody be-bop music industry by shining a contemplative spotlight on the late Philadelphia jazz musician Lee Morgan, a tremendously talented trumpeter blessed with a unique brand of artistry, but plagued by inner demons of drug addiction and a complicated co-dependency with his devoted common-law wife Helen — the individual responsible for his ultimate death by gunshot. To accomplish this, Collin shockingly, but skillfully, delves into these “marriages” in Morgan’s life with blistering aplomb. First, he looks at the finger-snapping brilliance of the vibrant sounds that epitomized the essence of Morgan’s musical craftsmanship while he succumbed to the perilous pitfalls of becoming a full-blown heroin junkie. Secondly, Collin dissects the bewildering relationship between the 33-year-old Morgan and the much older Helen Moore (12 years his senior) whose immense likability within the local jazz circles, and her rescuing Lee’s musical career and reputation by keeping him clean is only eclipsed by her aforementioned decision to gun down her lover in a crowded club on February 19, 1972. The premise to Collin’s dynamic documentary may appear to follow the conventional route via typical talking heads, archival footage and the running theme at hand — in this case the backdrop of the alluring music and the complex man that produced it through inspiration and torment. However, there is an interesting wrinkle in how Collin approaches this probing narrative. Although detailing Morgan’s harrowing backstory from his start as a teen trumpeting whiz in legendary jazz great Dizzy Gillespie’s band to his faltering drug addiction that threatened his prized musical abilities later in life is sufficient material in its own right, it is the “I” in I Called Him Morgan (read: Helen Moore) that produces the real juice to this polarizing, yet profoundly impactful, jazz artist’s story. Helen Moore Morgan would vehemently prove to be just as revered (and maligned) as her fallen soulmate whose life she claimed in an unsettling climate at Slug’s Saloon where she found him between sets in the company of another woman named Judith Johnson. The tactical backbone of Collin’s intriguing documentary is interestingly rooted in a tape recorded interview that was done a month before Helen’s death (she died in March of ’96). Smartly, Collin allows Helen’s own words to fill in the blanks about her devotion to the younger man she helped get back on track when she single-handedly rescued Morgan from his drug-related drudgery. Helen, a detached countrified product of the Deep South with a broken past and unfulfilled promises (a 14-year-old child-mother saddled with two kids of her own), was a psychologically wounded black woman that unselfishly healed others, becoming a surrogate den mother to the impressionable jazz hipsters in the East Village and Morgan’s eventual lover, confidante and savvy business manager. The puzzling — and weirdly appealing draw — is the affection they had for one another was so tight and concrete that the vast number of family, friends, associates and colleagues never saw this ruination as an outcome. Also, it is not quite clear if Lee or Helen saw the disconnection on the horizon either — something that is visibly disconcerting and distressing, to say the least. The spell-binding I Called Him Morgan can be seen as several things depending on viewpoint: A crime of passion as a result of an indescribable emotional eruption or a garrulous music film noir shaded in incredulous speculation and mystery. Whatever the case, the maternal and/or matrimonial-like ambivalence that the distressed, yet strangely resilient, Helen harbored so abundantly for Lee Morgan is starkly recalled with calculating candor. And with these revelations, one does not have to be an avowed connoisseur of jazz music (although it may help to enjoy the soothing and sensual accompanying music) to appreciate Kasper Collin’s powerful look at the meteoric rise and catastrophic fall of both prolific Blue Note recording artist Lee Morgan (he recorded 25 albums with the label as a leader and countless others as a sideman) and his supportive muse-turned-scorner Helen Moore Morgan.